Released on: March 25th, 2014. 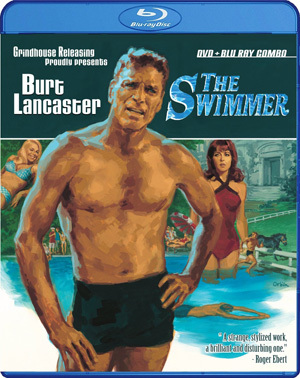 Directed by Frank Perry in 1968 and based on the short story written by John Cheever, 1968’s The Swimmer stars Burt Lancaster as a man named Ned Merrill. When the movie starts, Ned goes for a swim in a friend’s pool. After his swim he has a drink and gets to thinking that it might be fun to basically swim home, from one pool to the next. After all, there are enough pools around that they sort of form a river that he can follow. So he sets out to do exactly this, and as he does, his journey becomes unusual. Some of the people whose pools he swims through are happy to see him, others not so much and many of them are a little confused by his unexpected arrivals in their backyards. As he swims through each pool, snippets of his life are unveiled through the unusual conversations that occur between Ned and the different people he encounters on his journey. As all of this plays out, the allegorical connotations of Ned’s experience become more obvious, particularly when some of his memories conflict with those of the other characters and more so when some of them are decidedly taken aback by his presence. 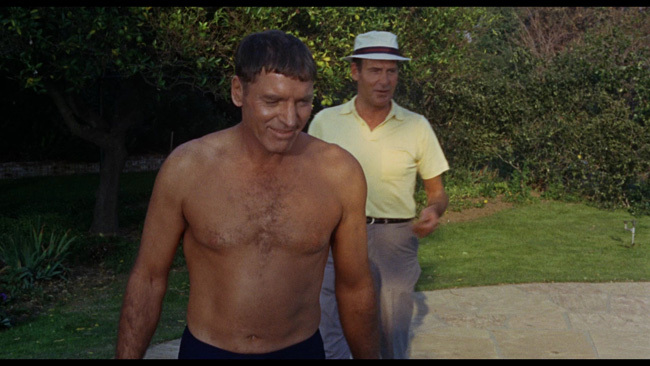 An oddly poetic and, by the time it’s all finished, remarkably sad film, The Swimmer features a remarkable performance from Lancaster. Fairly far removed from the stoic, heroic macho man characters he’d played over and over again by this point in his career, but in some unorthodox ways his Ned Merrill is just as heroic as any of the tough guys he’d played prior. 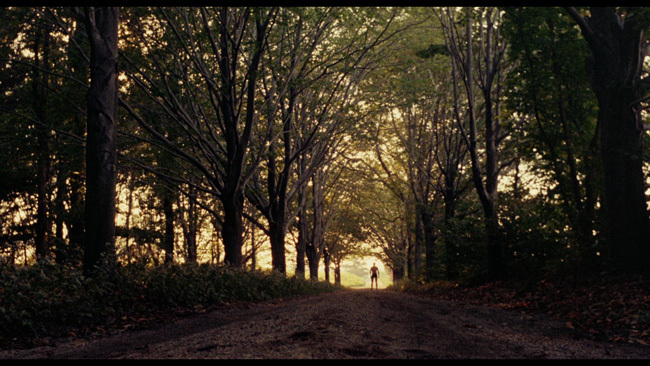 As he sets out on his journey we don’t know enough about him to see him as much more than a bourgeois suburbanite, the kind that you could picture with the white picket fence around his house and the pretty trophy wife waiting inside with dinner ready. In fact, the character does have a lovely wife and two daughters, he’s also notably prosperous in his career – he’s a success in life, it would seem. A winner, so he claims. As he sets out across his journey, however, we start to realize as the morning becomes afternoon and the afternoon becomes the evening just how fragile this ideal of masculinity really is. Lancaster invests much of himself into the role, he plays it completely straight despite the odd premise and he really gives Ned some believable character traits and personality. A quote on the Blu-ray packaging from Roger Ebert calls this Lancaster’s finest performance and it’s hard to argue with that summation, even if it is admittedly very high praise. Supporting efforts from Janice Rule as a mistress and Janet Landgard as a beautiful young girl enamored with Ned are both quite solid as well, but Lancaster’s work here is what impresses the most. Kim Hunter and, yes, Joan Rivers also have small but memorable roles in the film. Technically speaking the movie has an interesting look to it. 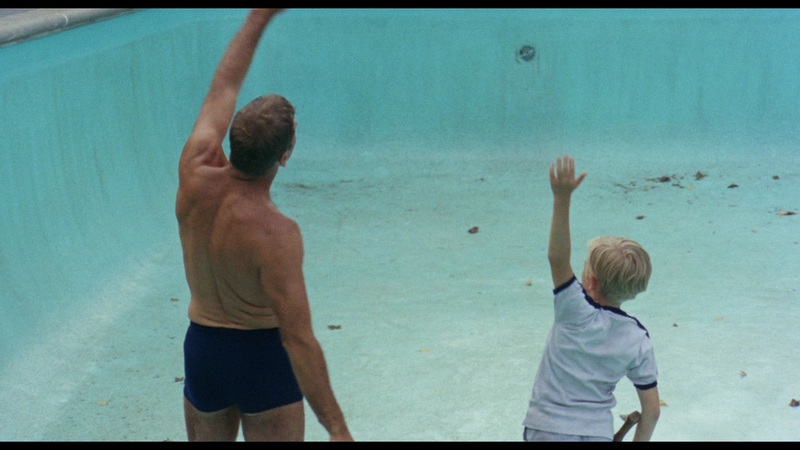 It’s very nicely shot and the compositions and the way in which the different pools are lit and framed tend to add to the allegorical implications that the story throws at the audience. The picture is technically well shot but stops short, intentionally, of becoming glamorous. The score by Marvin Hamlisch, might seem overwrought to some and more than a little obvious but it works in the context of the movie. The film is well paced and well put together and there’s enough technical polish here to compliment the multilayered script and remarkably strong performances. The Swimmer is presented on Blu-ray in a fantastic looking AVC encoded 1080p high definition transfer framed at 1.85.1 widescreen. As has been the case with all of Grindhouse’s Blu-ray releases so far, picture quality is excellent. Film grain is left intact but it’s never overpowering or distracting and outside of a few minor specks here and there, you won’t see much in the way of print damage at all – it would seem that the elements used were in excellent condition. Colors are reproduced beautifully, not just the blues of the water in the various pools but the greens in the surrounding plants and the colors that appear in the different late sixties attire worn by the various cast members. Black levels are good, shadow detail is fine and general detail is strong across the board. There are no obvious compression artifacts to complain about nor does there appear to be any edge enhancement or noise reduction at all. This is a nice, film like transfer that really does justice to the movie’s style. The English language DTS-HD Mono mix is also pretty good. There are no alternate language options though optional subtitles are provided in English, French and Spanish. All in all this is a nice mix, quite clear and concise sounding with no issues in regards to audible hiss or distortion. The audio is perfectly fine for an older mono mix and the single channel sound suits the movie nicely. Dialogue is perfectly easy to understand and the levels are properly balanced. The score sounds good as do the few effects that are used throughout the movie. 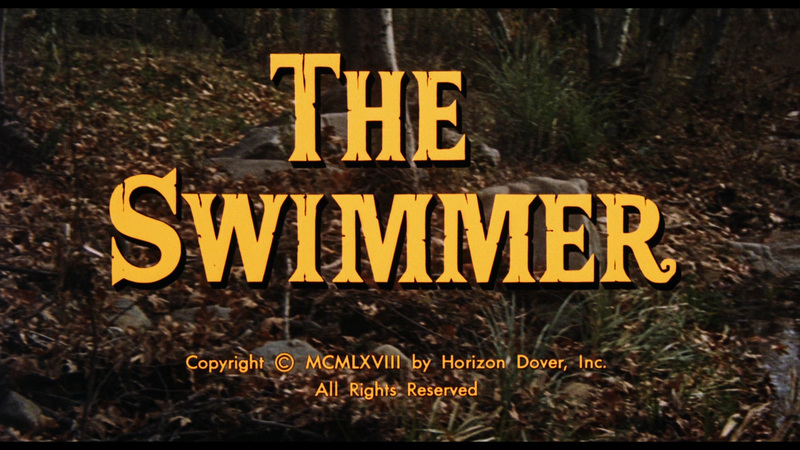 Extras start off with a fantastic five part documentary entitled The Story Of The Swimmer that is made up primarily of interviews with everyone Grindhouse were able to round up to contribute. Here we get input and recollections from cast members Janet Landgard, Marge Champion, and Joan Rivers, assistant directors Michael Hertzberg and Ted Zachary, composer Marvin Hamlisch, editor Sidney Katz, Burt Lancaster’s daughter Joanna Lancaster, and even Lancaster’s swimming coach Bob Horn, who taught at UCLA! It’s a very interesting and remarkably thorough piece that covers the technical side of things nicely. It also offers up some interesting memories of the shoot, the locations and the concepts behind the movie. 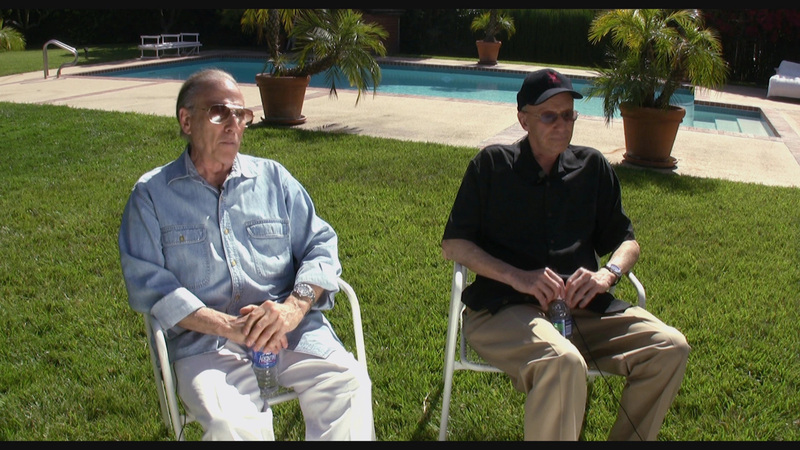 We learn what Lancaster went through to prepare for the role and we get some insight into not only what it was like to work on the picture but how the various participants feel about the film decades after they worked on it. Also quite interesting is an eighteen minute interview shot in 2013 at a festival screening with actress Marge Champion and film director Allison Anders. She shares a few more stories about working on this picture and a few others from her career and also offers her thoughts on the film. 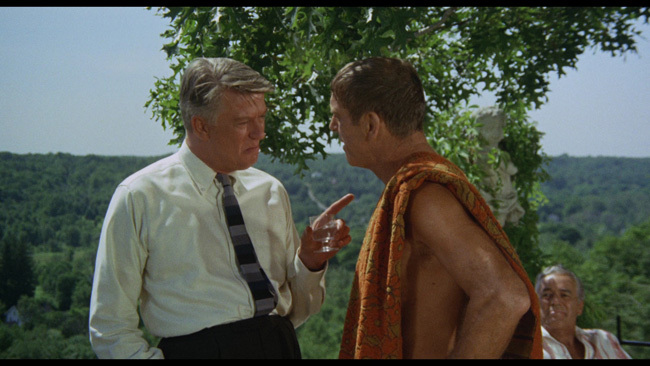 A twenty-five minute audio recording of John Cheever reading the short story he authored for The New Yorker and on which this film was based is also a noteworthy supplement. Rounding out the extras are a few very extensive still galleries featuring all sorts of promotional and pre-production materials, a PDF version of the original script accessible via BD-Rom drives, a pair of TV spots and a trailer for the feature. Additionally we get a bunch of other Grindhouse Releasing trailers, an isolated score, menus and chapter selection. As this is a combo pack release we also get a DVD version of the disc (so those without a BD-Rom can access the script if they want to) and inside the keepcase is a full color booklet of liner notes comprised of an essay from Stuart Gordon and a second essay from Chris Innis that offer a very thorough look at the strange history of this cinematic oddity. Grindhouse Releasing gives The Swimmer a fantastic Blu-ray debut. The presentation is up to the high standards set by their past releases as are the supplements which prove to be both comprehensive and genuinely interesting. The story behind this one is just as interesting as the movie itself. A fantastic package through and through. I've never seen this film but I read the short story as an undergrad. The ending hit me like a gut punch. Brilliant film. Lancaster has never been better.